Can you believe that a few days ago a toy poodle fell from the sky and landed on the grounds of a retirement home in British Columbia!?! The SPCA, who is now looking after the dog, believes that the scruffy toy poodle must have been dropped by a hawk or other large bird of prey. 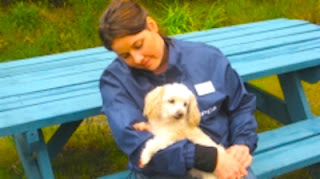 Sunshine Coast, BC retirement home nurses found the dog, who had broken ribs and several claw marks on her body. Vets believe the dog, nicknamed “Miracle May,” is a stray who had wandered around without care for some time before being snatched by the bird. All of her nails were so long they had grown into her paw pads and her teeth were badly decayed. “We don’t know how long she had been wandering without care, but she was obviously very neglected. It’s ironic, but this bird may have saved her life,” says Shelter manager Shannon Broderick. SPCA staff refer to the toy poodle as “The little dog with the big heart,” and are currently treating her and hoping for a full recovery.